Not exactly what one thinks of when one thinks of an art museum, unexpected riches in an unexpected place may be the best description of the Maynard Dixon Museum. 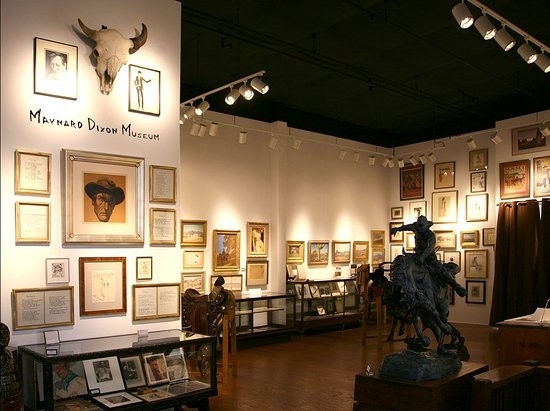 Unceremoniously located in a north Tucson strip mall, in the Catalina foothills, tucked in a back corner of Mark Sublette’s extraordinary Medicine Man Gallery — the Maynard Dixon Museum is small. But the overall experience is large — as was Maynard Dixon’s own mark on the world. The Medicine Man Gallery sells works of very high quality, and the space has the bounteous feel of a well-fed museum. Once known only for antique and Native American art, the Gallery now also offers early 20th-century paintings — including the work of the Taos Society of Artists — as well as Ed Mell and other well-regarded contemporary southwestern painters and sculptors. As we gradually made our way through the commercial gallery, stimulated by much truly captivating work, we felt no pressure to even pretend that we were there to spend money on art. The engaging and knowledgeable staff are happy to talk about the art and artists — or not. But we were there to visit the Maynard Dixon Museum, which displays Mark Sublette’s private collection. Dedicated to Dixon’s lifework, the bite-size museum “has tried to capture the essence of Dixon, the artist as well as the individual, not only through his artwork but through his letters and poetry,” says Sublette. Dixon’s well-used easel holds pride of place, surrounded by original paintings, drawings, and ephemera. 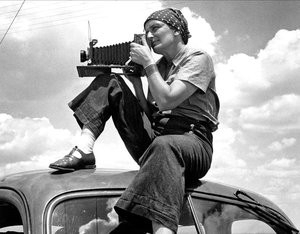 Also shown is work by Dixon’s third wife, Edith Hamlin — herself a painter — and photographs by his second wife, the well-known depression-era photographer, Dorothea Lange. Maynard Dixon was born in Fresno, California on January 24, 1875 (Happy Birthday, Maynard), into a family of prominent Virginia Confederates who had relocated after the Civil War. His well-educated mother shared her love of classical literature with her son and encouraged him in his writing and drawing. Early on, he earned a living as an illustrator working in New York, illustrating books and magazines with Western themes. But he soon returned to the western US to create “honest art of the West” instead of the romanticized versions he was being paid to create. Around 1915, Dixon’s art began to move away from his early impressionist approach, toward a simpler, more modern style. By 1925 he had become a true modernist, his style emphasizing design and color. 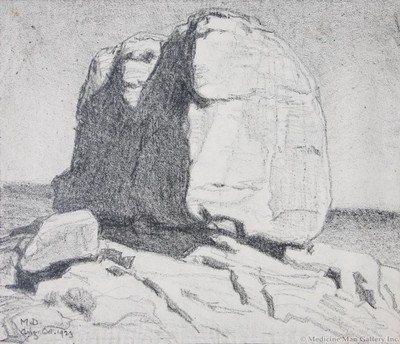 Distilling the non-essential, he became known for his simplified, bold, somewhat mysterious compositions featuring low horizons and marching cloud formations. Dixon became connected to Tucson when he and his third wife, San Francisco artist Edith Hamlin, a set up a home and studio and began spending winter months there. It was in Tucson that Maynard Dixon died, in 1946. The Maynard Dixon Museum offers an expansive view into Dixon’s life and work. While there’s little evidence of the “low horizons and marching cloud formations” he’s widely known for, the trajectory of his life work, his interests, and his relationships is laid out in fascinating detail. Sublette’s collection includes 121 paintings and drawings, plus masses of letters, photographs, Dixon-illustrated books, and other artifacts. Visitors are welcome to take their time — there’s a tremendous range of objects to see. And there’s a story behind every item. 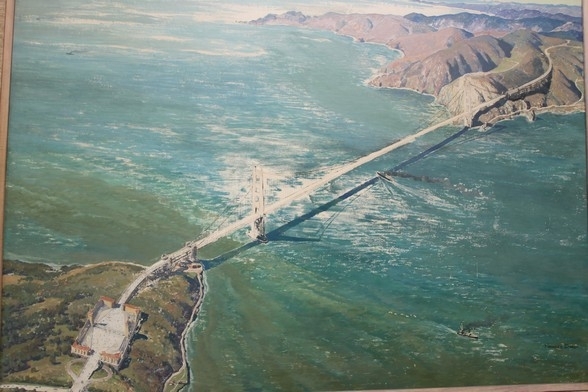 It’s a little-known fact that Dixon was involved in the early stages of planning for the Golden Gate Bridge. He was active in countering opposition to the bridge by those who feared it would destroy the natural beauty of the San Francisco Bay inlet. It was on Dixon’s recommendation that Irving Foster Morrow was brought in as the consulting architect to design the formal, aesthetic treatment for the bridge, and it was Dixon who proposed the rust-red color, as an antidote to San Francisco’s gray weather. Morrow’s conceptual drawings were influenced by Dixon’s early renderings and vision for the Bridge. Some of those early renderings have recently been acquired by the Museum. The Maynard Dixon Museum is the product of 25 years of collecting by Mark Sublette, who over the years has become an authority on the life and work of the artist. Sublette’s wife, Kathleen, told me that it was Dixon’s unromanticized appreciation of Native American culture that originally sparked his interest in the artist. 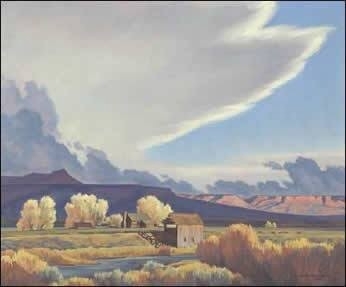 In addition to his expertise about Maynard Dixon, Mark Sublette has authored numerous catalogs on Native American subjects and is a contributor for Western Art Collector and other art publications. And why is the host Gallery named Medicine Man? Both Mark Sublette and his wife were physicians before dedicating themselves to the Gallery and the Museum. If you’re a Western art enthusiast, a visit to the Maynard Dixon Museum is bound to cure whatever ails you.